The cast of Jessica Huang’s ‘Purple Cloud,’ produced by the Asian American Theater Project (Courtesy of Frank Chen). 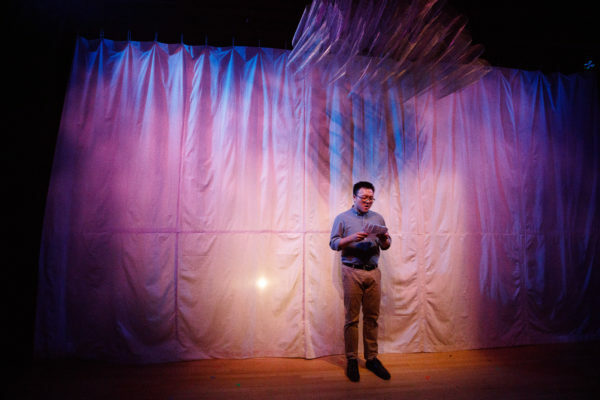 What does it mean to be “more part than whole?” As the characters of the Asian American Theater Project’s (AATP’s) “Purple Cloud” attempt to slog through this question, the air as thick with troubling implications as the often-mentioned Shanghai fog, the audience grapples to find out. “Purple Cloud,” directed by Sam Sagan ’18 and presented June 1-3 at 8 p.m. in the Elliott Program Center, slices and probes into every aspect of identity in order to discover what it means to be a “hapa,” or individual of mixed-race heritage. As the characters conflict with ideas that their “parts” fail to make a complete whole, they develop a message of hope for any individual who has ever struggled with finding their own sense of belonging. “Purple Cloud” follows the story of an 18-year-old girl, Hapa Girl, nicknamed “Loco” by her classmates but dreaming of adopting her true Chinese name, Xian Ji, as her hazy family history unfolds around her. Much of her frustrations with uncovering her family’s roots in an attempt to understand herself come from her hyper-protective father, Orville Wilbur (Hank Tian ’20), and her mysterious grandfather, Lee Huang (Matt Shimura ’19), both of whom are also mixed-race. An unusual package sent by her grandfather sparks an interest in connecting with her Chinese heritage. As the journey begins to dig up these connections, the show transitions between scenes of Hapa Girl’s tense relationship with her father, set in the modern day, and scenes of her grandfather growing up in the 1950s. Hapa Girl’s tumultuous path eventually leads her and her father back to China, where they both must face the reality of what the summation of their “parts,” or varying heritages, means. Hank Tian as Orville Huang in ‘Purple Cloud’ (Courtesy of Frank Chen). Hapa Girl (Lili Lim ’17) is the perfect picture of teenage angst. We cannot help but empathize with her antics (getting tattoos, stepping out); her world is too small to satisfy her as she longs for a sense of true identity. Of course, it wouldn’t be teenage angst without butting heads with a strict, authoritarian father. Tian manages to find the perfect balance between care and discipline, allowing the audience to understand that no matter how frustratingly exactingly he behaves, his actions are truly in the best interest of his daughter. Hapa Girl chips away at Orville’s guarded exterior piece by piece, revealing a beautiful dynamic of the roles of “father and daughter” melting away to reveal simply two individuals struggling to find a place in the world. 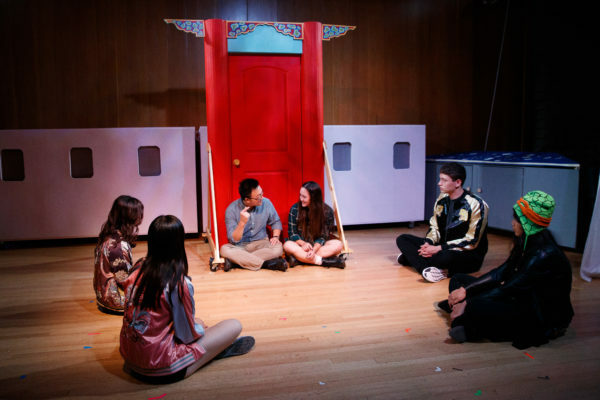 A facet of this show that serves to perpetuate a sense of fantasy in a world of real, concrete problems is the consistent narration by the personified jade figurines, Dragon (Olivia Popp ’20), Bird (Catherine Xie ’19), Tiger (Max Drach ’17) and Tortoise (Natty Jumreornvong ’17). The quartet addresses the audience directly in an explanatory yet enthusiastic fashion as they relay both facts about China and facts about the inner workings of the main characters’ minds. Often the source of the show’s lighthearted humor in contrast to the tougher topics Hapa Girl and Orville must face, the jade figurines serve to provide honesty and clarity to the often-convoluted, clouded Huang family history. The show, at times, became difficult to swallow. In its “flashback” moments taking place in the fifties, Lee Huang is often asked, with sharp precision: “What are you?” followed by his stark hesitation at answering. The insensitivity of this comment rings through the Elliott Program Center and sinks into the audience’s bones. These flashbacks bring up the ugly underbelly of American racism as Lee is mistreated consistently by those looking to cultivate a certain whitewashed image of the U.S. that is no longer feasible. However, perhaps the most troubling aspect of Lee’s situation the audience must digest is the manner in which he rolls over. In order to find success and care for his family, Lee succumbs to the pressures of those around him to fit a more American mold, and his abandonment of aspects of his true Chinese identity, piece by piece, leaves the audience in a sense of heartbreak. At the center of the relatively simple set hangs a shimmering wire cloud, illuminated by soft, almost dream-like purple light. The cloud serves different purposes for each character. For Orville Huang, a wisp of a familial past that need not to be addressed. For Hapa Girl, a guiding light drawing her home. For Lee Huang, a representation of his legacy. The cloud takes on a different meaning for the audience. Its consistent presence throughout the show serves to symbolize one of the most important pillars of identity that the characters struggle to grasp: your identity is there, and it is only a matter of your determination not only to discover it, but to embrace it. Contact Elizabeth Gerson at egerson ‘at’ stanford.edu.